Dear North Idaho Propane - This note is to thank you, and particularly your drivers, for propane delivery under the most adverse weather conditions. William P.
Outstanding service & safety are our #1 priority. 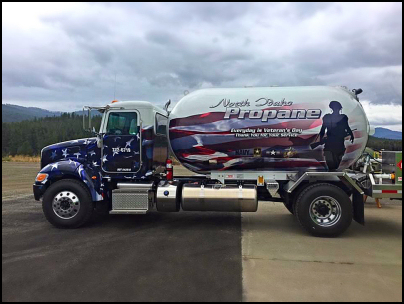 North Idaho Propane provides fast, friendly, farm, home, and business propane delivery service to customers in North Idaho including Coeur d'Alene, Post Falls, Hayden, Sandpoint, St. Maries, and more. (See a full list of cities that we serve). We have two types of Delivery options: Keep Full and Will Call. Keep-Full Service means just that. It is the driver's responsibility to keep your tank full and not let you run out of fuel. You don't have to check the gauge and call in when you need a delivery. We offer 30 day charge accounts, subject to credit approval, that allow payment flexibility. Will Call means that it is up to the customer to check their gauge and call into the office five (5) working days ahead of a needed delivery. The driver needs the 5-day notice due to scheduling routes since he may only be in a particular area one day a week. A 30-day charge account is an option, subject to credit approval / and staying in good standing. When the tank reaches 30% it is a good time to call in your fuel order. Don't let your tank run out of gas! If your tank becomes low on gas (5% or below) or runs out of gas it will mean added costs to your propane bill. If your propane tank has reached 5% or below it is a code requirement (International Fuel Gas Code) that the driver or serviceman check that the pilot light and or the appliances are still operating. If your propane tank has run out of gas, it is a code requirement that a Leak Test be done. It is also necessary for the driver or service technician to relight or restart all appliances that operate on propane. These codes and requirements are in place to keep safety first and foremost. To avoid additional charges, use our "Keep Full" Service, or be sure to call when your tank reaches 30%. Call us anytime day or night if you have a propane emergency. Your safety is first and foremost with North Idaho Propane. Propane tanks or cylinders are subject to recertification (also known as requalification) twelve years from their date of manufacture and every five years after that. North Idaho Propane can Re-certify your propane tank and make sure it is in safe working order. North Idaho Propane can fill the cylinder that you use for your gas barbecue or other purposes. Make sure that your propane tank is filled correctly and by a professional by having North Idaho Propane fill your propane tank. We recommend a regular Gas Safety Check performed by one of our service technicians to ensure that your system is safe and that it meets safety codes. Our technicians will check for leaks, pressure test your lines, as well as inspect your tank, gauges, pipes/piping, vents, valves, pilots, thermostats, connectors, burners, and appliance controls to make sure they are safe and working properly. There is no charge for your first Gas Safety Check. Regular service fees apply thereafter. Call us to schedule your Gas Safety Check or for more details.